Okay, when I do a book review, I typically quote the publisher's information and give my own opinion. 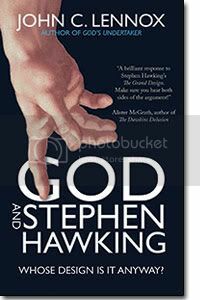 This time, I'm pulling a lot more from the press release for the book God and Stephen Hawking: Whose Design is it Anyway by John C. Lennox. Because this press release sums up so much of what I want to say anyway. This is a short book, and despite being written by a mathematician and philosopher, it is incredibly easy to read. Lennox makes sense, he makes his points clearly, and this was a great read. If you have ever done anything like read A Brief History of Time by Stephen Hawking, and particularly if that book left you convinced of only two things -- Hawking is a genius and I am not, then God and Stephen Hawking is for you. What I love is that Lennox doesn't dispute that Hawking is a genius -- but he still can go through and deconstruct Hawking's arguments in The Grand Design (where Hawking claims that philosophy is dead, as is God). I enjoyed reading this book, because although Lennox is clearly brilliant also, he writes in a style that mere mortals can actually comprehend. This sounds like a great one! I'm going to have to check it out.